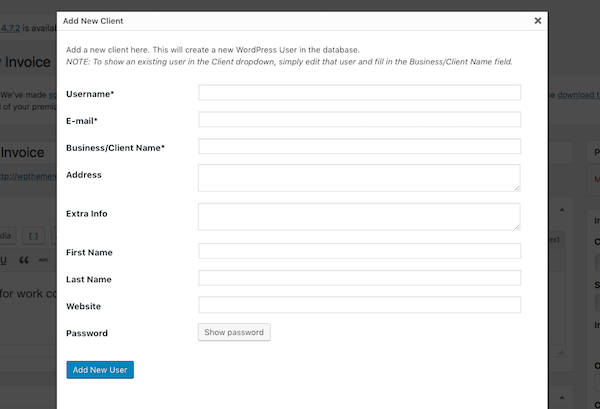 When running a WordPress-based business, streamlining your workflow is important. This is doubly the case when managing multiple clients. Anywhere you can save time is a worthwhile endeavor. Too often, each aspect of running a business has its own bit of software and it’s own separate interface. That means separate tools to manage assignments, organization, and invoices. Talk about a headache. While you still might need separate tools to manage all of these aspects of your business, there are now many WordPress integrations, which means you can check off more tasks from your to-do list from within the WordPress dashboard. 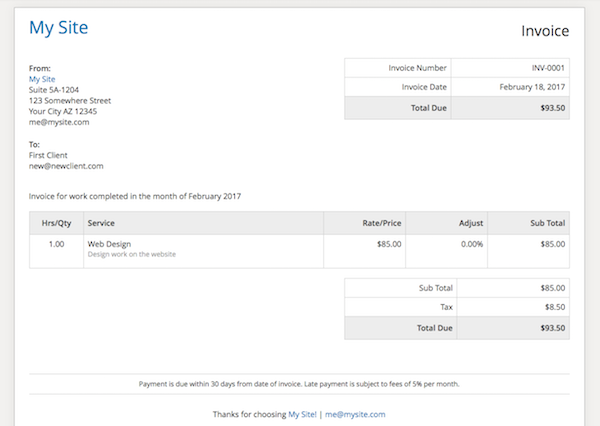 Today, we’ll be discussing WordPress invoices and how to add this capability to your workflow using the Sliced Invoices plugin. 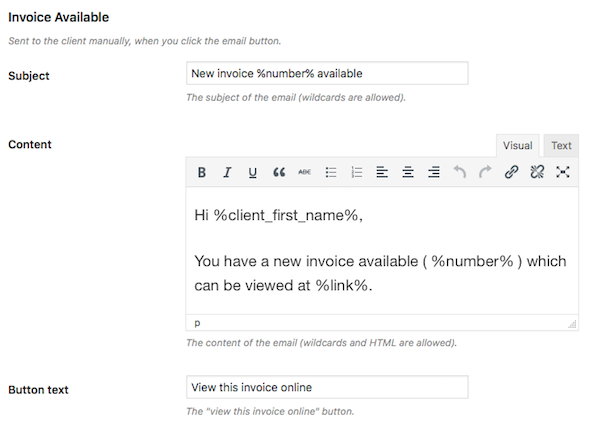 The Sliced Invoices plugin is a full-featured invoicing system that is easy to setup and use and lets you create and send invoices from within WordPress. It also lets users create project quotes to submit to potential clients. Some of the plugin’s general features include the ability to pre-define line items, multiple tax settings, custom email settings, the ability BCC yourself any invoices you send, client reminder emails, cloning, and three customizable templates. 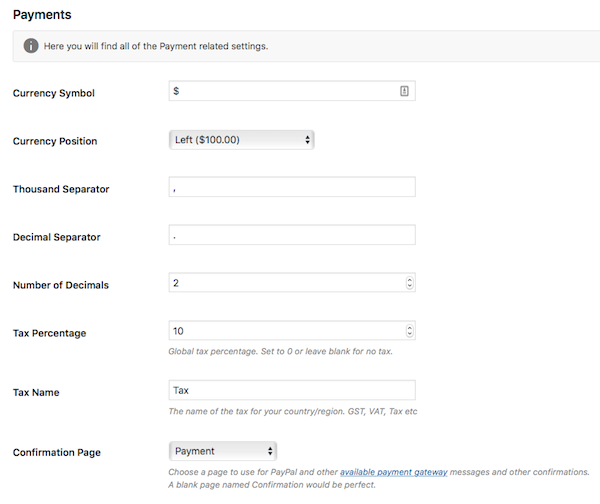 As it relates directly to invoicing, this plugin packs a punch. 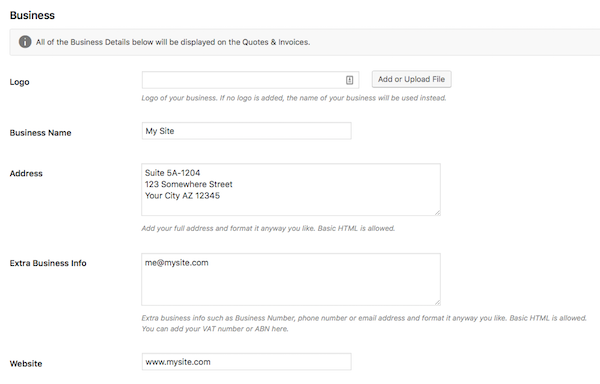 Add a custom logo to invoices and quotes. Import quotes and invoices in bulk in CSV format. Many other features are included for creating Quotes as well. Price: Free. Several extensions are available to expand the functionality of the plugin. While a few are free (likeGravity Forms and Better URL) most are premium including Recurring Invoices, Deposit Invoices, and Stripe Payment Gateway. Here, you can configure the basic details about your invoices, including your fiscal year reporting and any pre-defined line items you want to save to use for multiple invoices across multiple clients. In our example here, the line items are broken down by the unit of measurement (hour), the type of work (web design), the dollar value per hour ($85), and a description of what the service entails (Design work on the website). 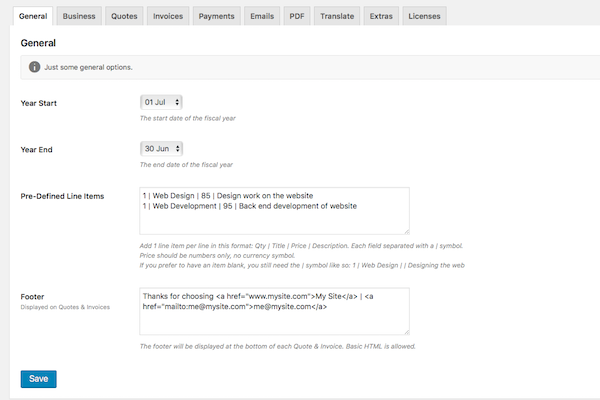 You can customize the footer message you’d like displayed at the bottom of each invoice here as well. Click Save. Here, you can upload a custom logo and fill in your company name, address, website address, and any other information you’d like displayed on your invoices. Click Save again before moving onto the next tab. 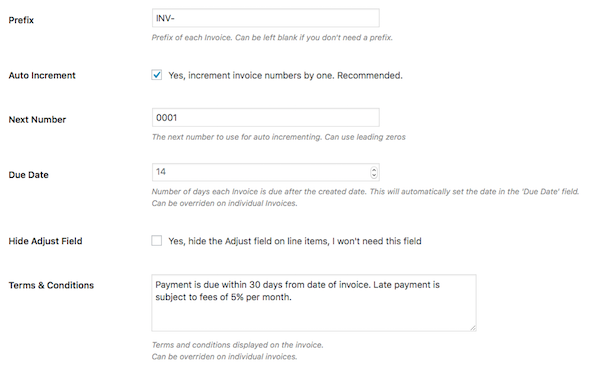 On this screen you can configure the prefix you want assigned to your invoices, whether or not you want them to auto increment, the next number for your invoices, how many days should pass before an invoice is due, and the terms and conditions. You can also select from one of three templates and insert custom CSS if you wish. Click Save. Pick your desired currency, how many decimal places you want to be displayed, the tax percentage, the tax name, and the confirmation page you want displayed. Next, insert the payment methods you’ll accept. 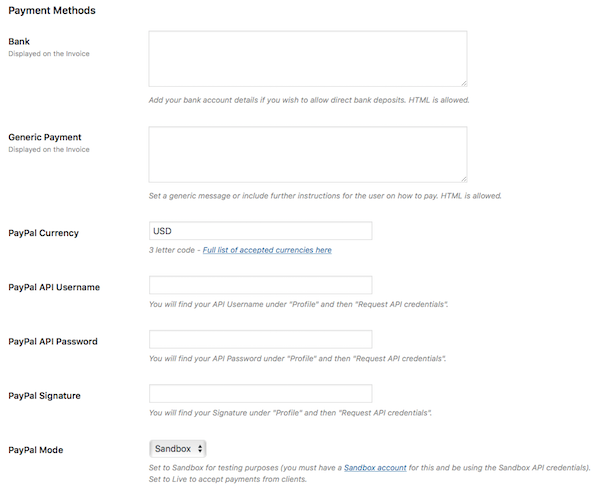 You have the option to include your banking information, a general payment message, PayPal currency, and your PayPal account information. Click Save. Input your preferred email address and then select if you’d like to receive a BCC on all client emails. 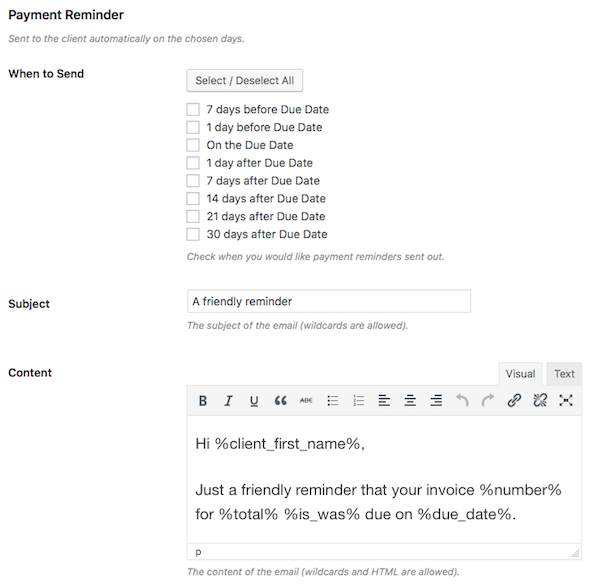 Next, customize the message that will be sent to your clients along with an invoice. You can modify the email subject, content, and button text. 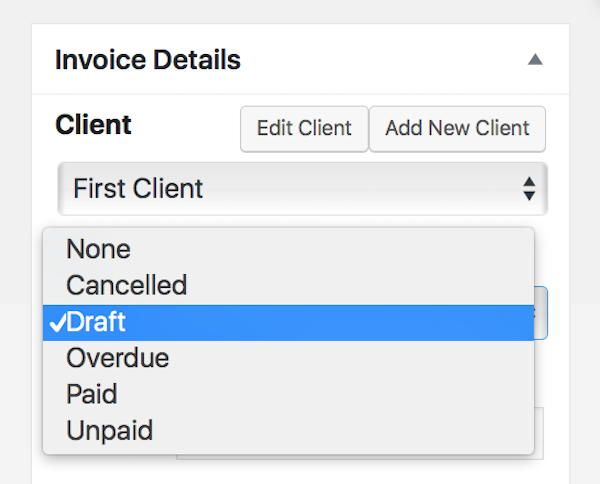 There’s a list of “wildcards” at the bottom of this screen that allow you to auto-insert information like the client’s name and the invoice number. Scrolling further, you can customize the message clients will receive after they send a payment. You can use wildcards again here in the subject and content fields. Last for this tab you can set up when a payment reminder should be sent to your clients spanning from on the due date to up to 30 days after the due date. You can also customize the subject line and the content of the email that will be sent to the client along with the reminder. Click Save. 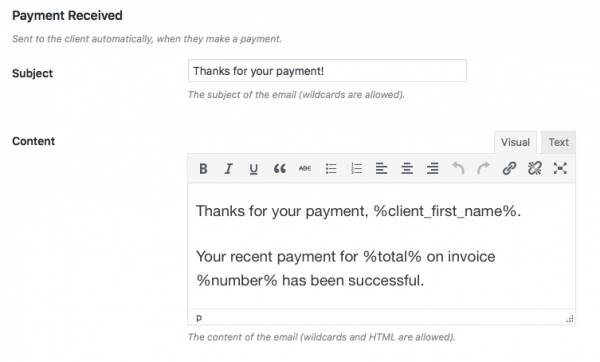 Fill in the details you want to include in your invoice, just as you would with a blog post. In this case, you can add a title and a description. Next, add the line items for your invoice. You can insert the item title and the rate manually or select from the dropdown menu of pre-defined line items. In this case I chose “Web Design” and it automatically filled in the specs for this service. Then you can adjust the quantity to reflect the amount of work actually completed during the billing period. Scroll a bit and insert the terms and conditions you’d like assigned to the invoice. Now, looking to the right hand side of the screen, you have many options to tinker with here. The section is called “Invoice Details” and this area gives you the chance to modify the client this invoice will be sent to, the status of the invoice, and invoice number. 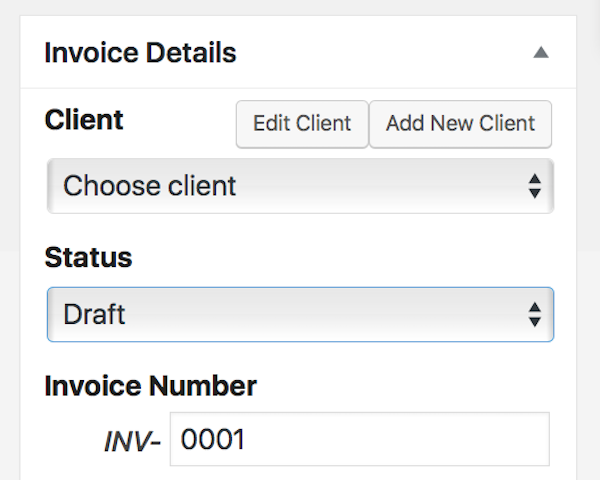 Since this is our first invoice, we need to add our first client, too so click the Add New Client button. Click on the invoice you want to modify or manage. Then on the right hand side of the screen, change the invoice status to Cancelled, Overdue, Paid, or Unpaid depending on the circumstances. Be sure to save your changes. 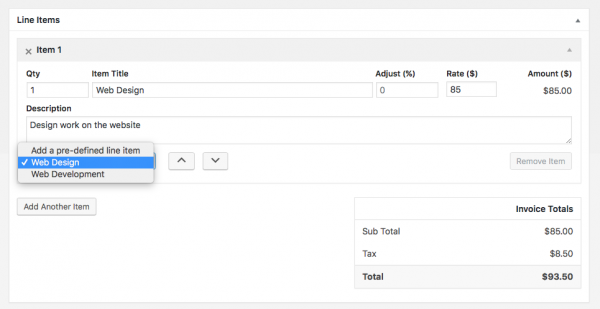 While there are other tools for creating WordPress invoices, Sliced Invoices is one of the most intuitive tools I’ve come across that fully incorporates the client and financial management aspects of running a business into the WordPress dashboard.